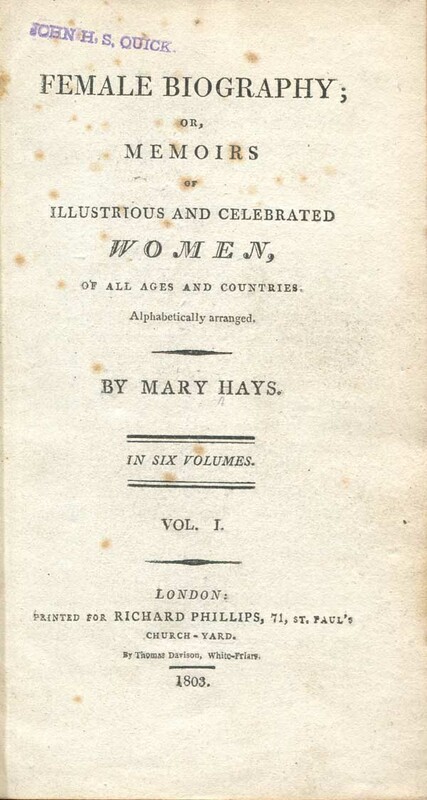 Hays (1760-1843) was a feminist, the child of Rational Dissenters (who believed that state religions impeded freedom of conscience, and that concepts like original sin and the trinity were irrational), and a friend of Mary Wollstonecraft (whom she met in 1792). She treats queens & empresses (Elizabeth I, Catherine II), writers (Anne Bradstreet), and even semi- mythical figures (Dido and Boadicea). The Watkinson has both the first English (6 vols, London, 1803) and the first American (3 vols, Philadelphia, 1807 ) editions. 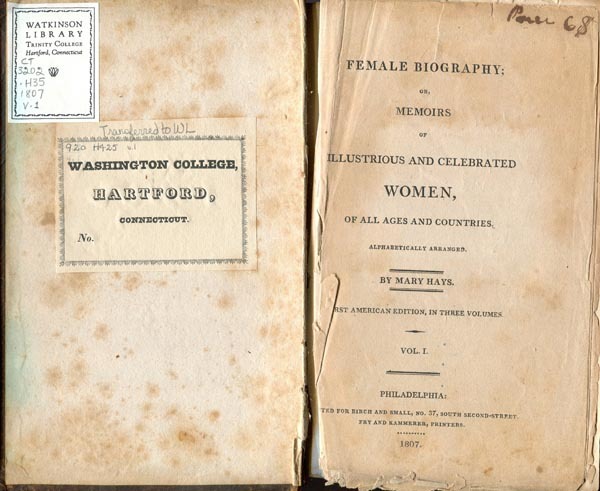 As you see from our copy of the latter, it has been in the library for at least 165 years (note the bookplate–Trinity was called Washington College from 1823-1845). The coverage is quite uneven, with some women (Madame Bontems) getting scarcely a paragraph, while others run almost 150 pages (Catherine I). 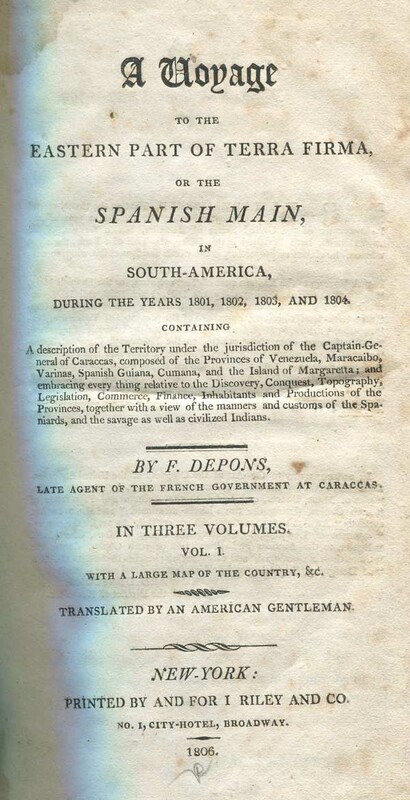 “No person [from Spain, much less Europe] is allowed to embark for Spanish America, without obtaining permission from the king, which is never granted but for commercial purposes, duly verified, and for a time commonly limited to two years . . . This system, as appears, is entirely opposite to that of other countries, who leave their colonies so unreservedly open to all who wish to go to them, that these establishments [the colonies] have been regarded rather as the foul receptacles of all the impurities of the mother country, than objects of deliberate predilection. About thirty years ago, if a young man discovered any alarming symptoms of depravity in his conduct, he was threatened by his parents with being sent off to the colonies; and the common mode of proceeding was to apply to the public authority, in order to be able to execute the threat. We have seen decrees passed in France to commute corporal punishments for transportation [i.e., forced exile] to the colonies . . . Spain, more just or tender towards her colonies . . . has always directed, and continues to direct, her whole attention to preserve the purity of their morals, and prevent them from receiving the taint of European corruption. From the 7th of August, 1584, no person has been permitted to go to the West Indies, unless he could present authentic information with respect to his morals and good behavior” (vol. 1, pp. 107-08). 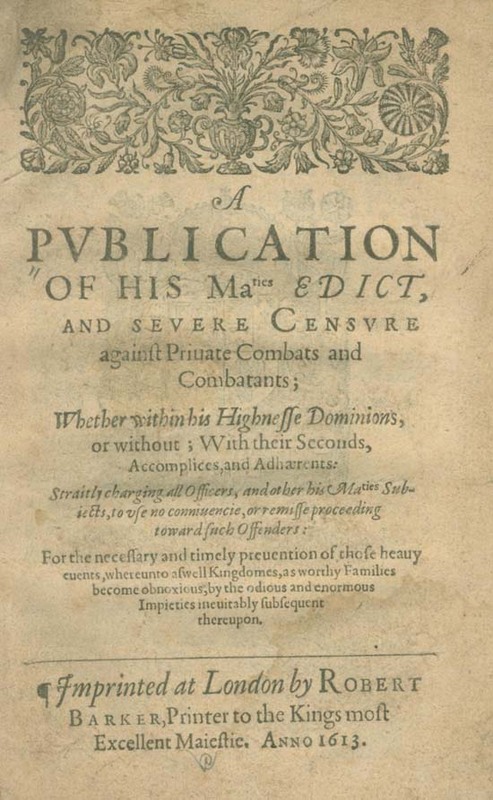 A publication of His Majestie’s Edict, and severe censure against private combats and combatants. (London, 1613). This tract of over 100 pages was issued with a proclamation forbidding duels, explaining the measures King James I of England (1566-1625) was prepared to take in suppressing them. It was likely written by Henry Howard (1540-1614), Earl of Northampton, even though it appears under the royal arms, and King James put his name to it in later collections. According to the 1911 Dictionary of National Biography, “Northampton took an active part in political business, and exhibited in all his actions a stupendous want of principle” (how those old Brit academics could turn a phrase!). During Elizabeth’s reign Howard barely escaped treason and conspiracy charges several times, having been suspected of colluding with Mary in Scotland, or with his brother Thomas Howard (fourth Duke of Norfolk, who attempted to wed Queen Mary, and was eventually executed). Both brothers were tutored early on by John Foxe, the martyrologist (the Watkinson also has Foxe’s works in editions dating from the seventeenth to the nineteenth centuries). Comments Off on En Garde! You are currently browsing the The Bibliophile's Lair blog archives for August, 2010.